← ‘Open Research’ on the OU Library podcast! Did you know that as well as linking ORO to ORCiD you can also link your ORCiD with your ORDO profile? This will add all your datasets in ORDO (and anywhere else that uses a DataCite DOI) to ORCiD. This will open a panel called Link Works. Find DataCite in the list. To check the authorisation has worked successfully head back to ORCiD and to your Account Settings tab. DataCite should now be listed as a Trusted organisation. 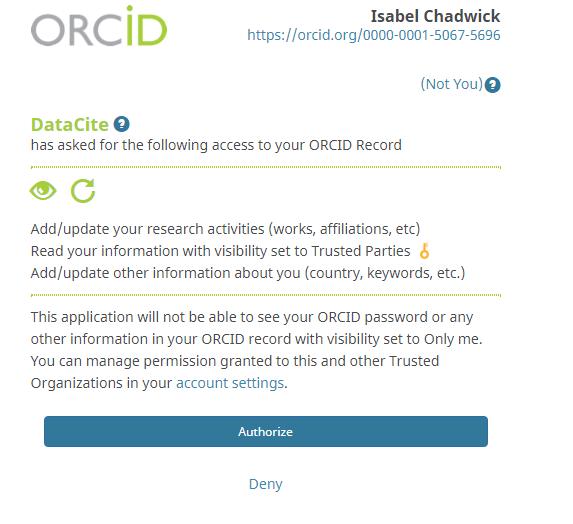 If you’re having problems setting this up or would like more information about using ORDO or ORCiD, please get in touch. This entry was posted in ORCID, ORDO. Bookmark the permalink.